If you haven’t been paying real close attention over the past year or two, there have been many more reports of excessively high-nitrate or nitrate-nitrogen concentrations in annual forages, also known as cover crops, than there have been dead livestock from consuming them. Well, maybe not fishy, but at least not fully explained by the standards of currently published nitrate toxicity levels that should have animals lying horizontal. In the Nebraska study that was reported by Mary Drewnoski, a beef specialist at the University of Nebraska (UN), the researchers obtained the testing results from over 400 fresh annual forages that had been submitted and analyzed by Ward Laboratories Inc. (Kearney, Neb.). The samples were sorted as follows: brassica, cover crop mix, small grains, millet, and sorghum species. In addition, samples from UN grazing trials were also evaluated, one set of which was grown in the same field. Forty-eight percent of the brassica samples submitted (n=63) to the laboratory by producers were in either the caution (2,100 to 5,000 parts per million [ppm] nitrate-nitrogen [NO3-N]) range or at a toxic (more than 5,000 ppm NO3-N) level. For the other species, 20 (small grains) to 28 (cover crop mix) percent fell into those same two categories. In the Nebraska grazing trials, a mix of oats, turnips, and radishes had NO3-N concentrations ranging from 2,158 to 6,146 ppm. Monoculture oat trials ranged from 912 to 8,026 ppm NO3-N. In the total of six different trials, animals had grazed these forages without any negative repercussions. (Editor’s note: Sometimes guidelines are reported as ppm of nitrates rather than nitrate-nitrogen. Comparable nitrate levels are 4.43 times greater than nitrate-nitrogen). When asked what she thought was going on and why the current long-time thinking on nitrate toxicity didn’t seem to apply to these animals grazing annual forages, she said, “It’s probably several factors based on what we can find in the scientific literature. “When grazing, cattle eat over longer periods of time and so the rate of intake is slower. There is also a good indication that fresh forages release nitrate slower into the rumen than we see with dry feeds. We also know that energy supplementation has helped reduce the incidence of nitrate toxicity and many of these annual forages, especially brassicas, are extremely high in energy,” the beef specialist opined. Drewnoski also noted that grazing behavior may come into play because cows usually graze from the top down. As a result, more of the high-nitrate stems, especially the lower portions, are left in the field. So, what’s the next step in this high-nitrate enigma? “We still need more studies, but ultimately the goal is to build nitrate-risk guidelines for animals consuming fresh forage,” Drewnoski said. 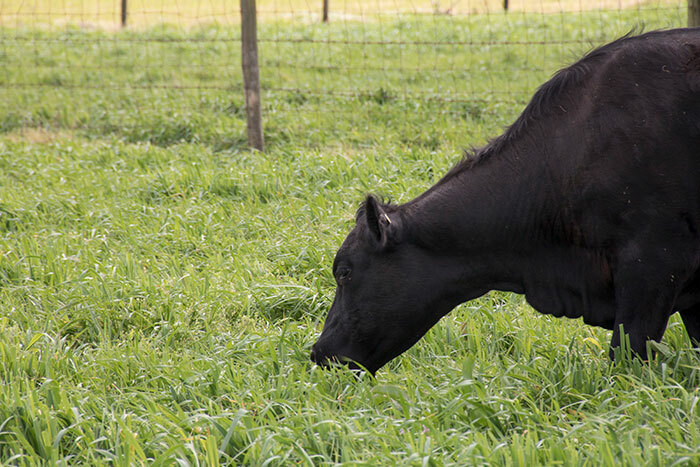 Even though there’s a body of building evidence that cattle can tolerate higher levels of nitrate on fresh forage, some caution needs to still rule the day until more definitive information is known. 1. Make sure cattle are full before putting them on fields. Dry hay works well as a filler. 2. Keep in mind that the group with the greatest risk of negative consequences from grazing high-nitrate forages is pregnant cows, as abortion can result. Open cows or growing calves (stockers or younger heifers) offer a lower risk. 3. Gradually adapt animals to high-nitrate annual forages. Start by grazing the lowest nitrate fields and then work up to the highest. 4. Graze higher nitrogen fields lightly to allow animals to selectively graze plant parts that are lower in nitrate concentrations. 5. Consider grain supplementation while adapting cattle to high-nitrate, lower-quality forages such as mature sorghum-sudangrass hybrids or pearl millet. This will supply energy for rumen microbes to convert nitrate into bacterial protein.